Program for the Conference on the Future of the Smithsonian, February 11, 1927. Record Unit 46 - Office of the Secretary, Records, 1925-1949, Smithsonian Institution Archives. 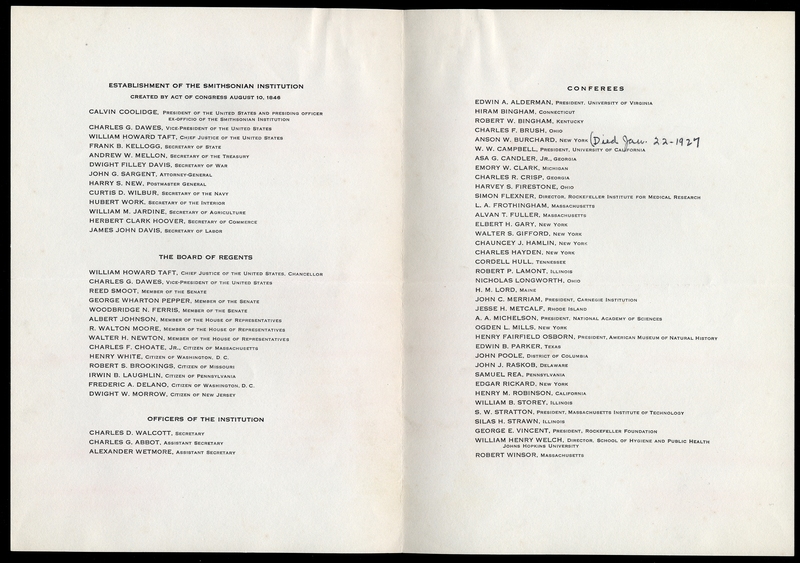 List of attendees at the Conference on the Future of the Smithsonian, February 11, 1927. Record Unit 46 - Office of the Secretary, Records, 1925-1949, Smithsonian Institution Archives. Guide to the guest list for the Conference on the Future of the Smithsonian. Record Unit 46 - Office of the Secretary, Records, 1925-1949, Smithsonian Institution Archives. 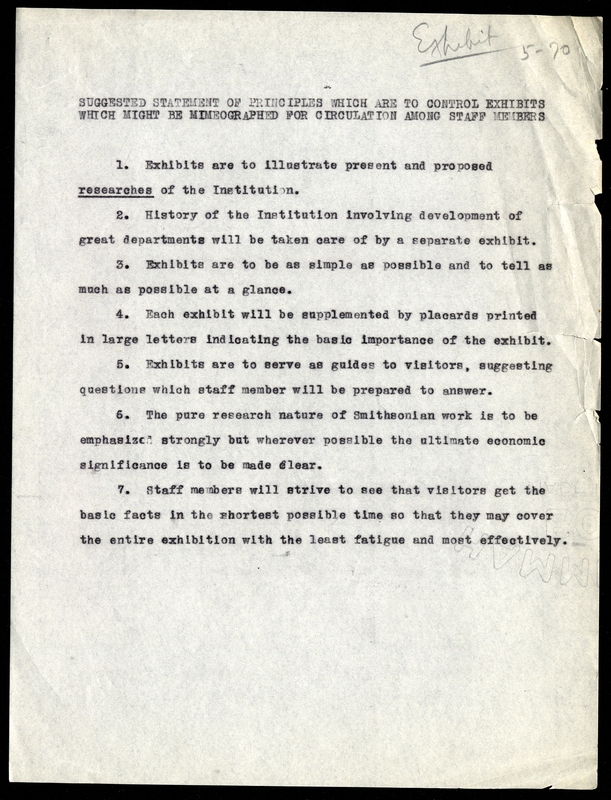 Exhibit guidelines for the Conference on the Future of the Smithsonian. Record Unit 46 - Office of the Secretary, Records, 1925-1949, Smithsonian Institution Archives. Preparation list for the Conference on the Future of the Smithsonian. Record Unit 46 - Office of the Secretary, Records, 1925-1949, Smithsonian Institution Archives. 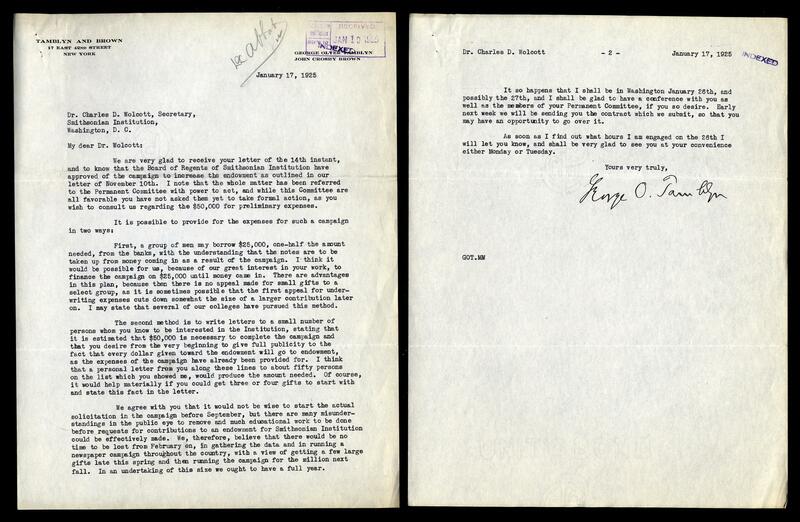 Letter from George O. Tamblyn to Smithsonian Secretary Charles D. Walcott regarding the capital campaign, January 27, 1925. Record Unit 46 - Office of the Secretary, Records, 1925-1949, Smithsonian Institution Archives. 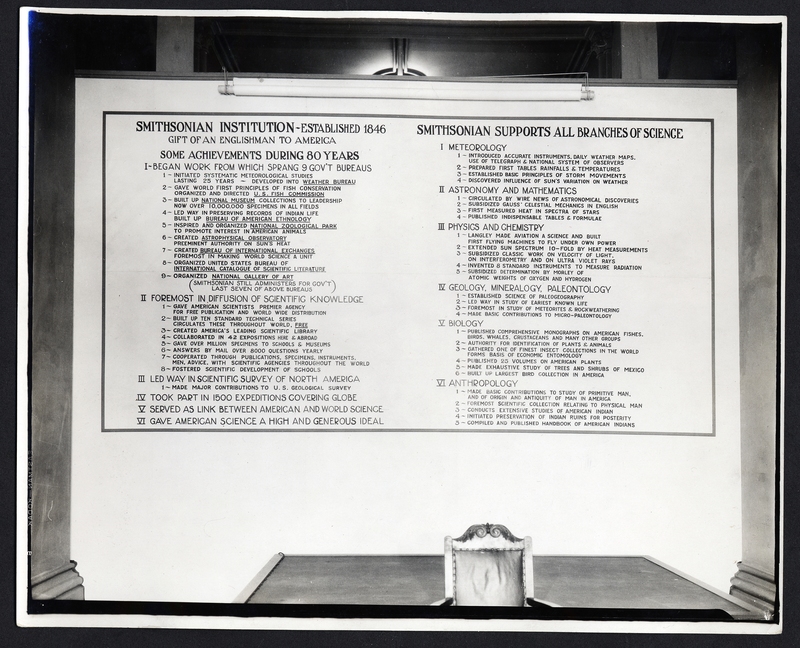 List of Smithsonian Achievements at the Conference on the Future of the Smithsonian, February 11, 1927. Record Unit 46 - Office of the Secretary, Records, 1925-1949, Smithsonian Institution Archives. 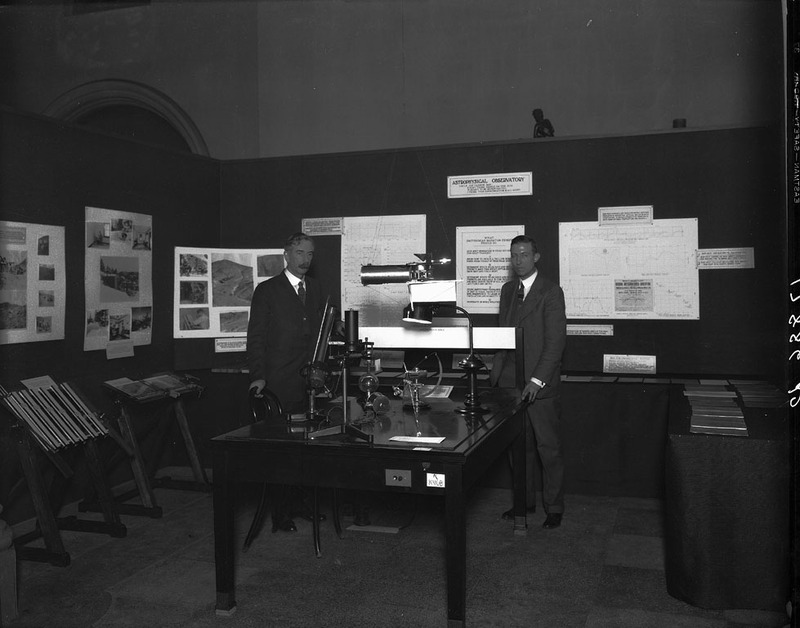 Astrophysics Exhibit at the Conference on the Future of the Smithsonian Institution on February 11, 1927, with Charles G. Abbot and Loyal B. Aldrich. Record Unit 46 - Office of the Secretary, Records, 1925-1949, Smithsonian Institution Archives, neg. no. MNH-17886d. 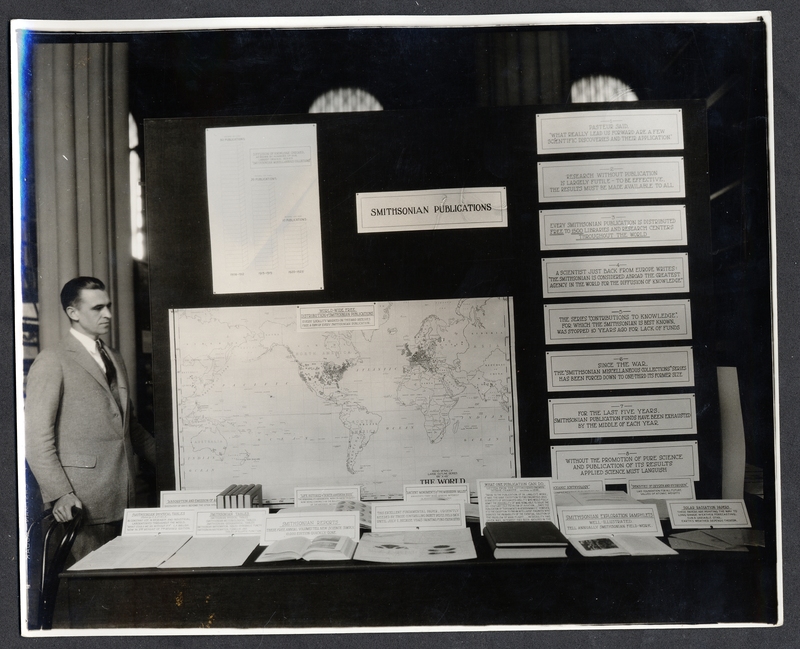 Exhibit of Smithsonian Publications for the Conference on the Future of the Smithsonian, February 11, 1927, with Webster Prentice True, Editor. Record Unit 46 - Office of the Secretary, Records, 1925-1949, Smithsonian Institution Archives. 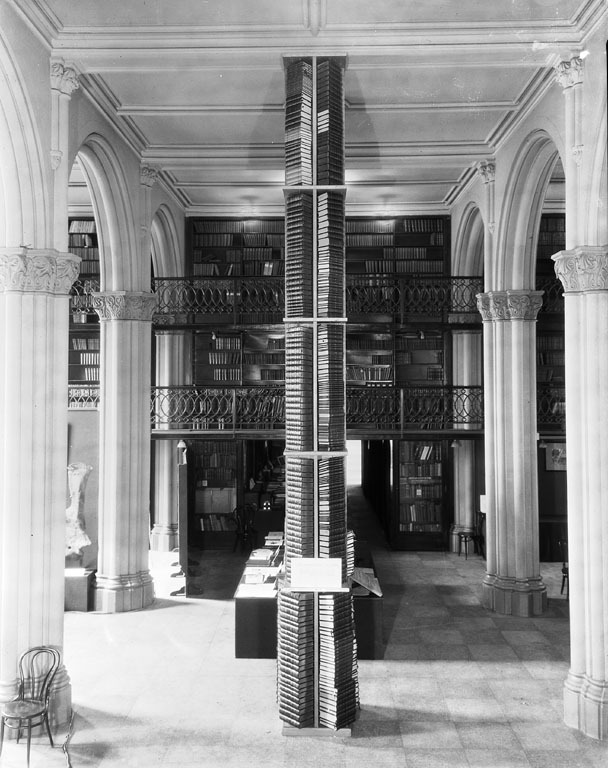 Book Tower comprised of Smithsonian Publications at the Conference on the Future of the Smithsonian, February 11, 1927. Record Unit 46 - Office of the Secretary, Records, 1925-1949, Smithsonian Institution Archives, neg. no. MAH-17888a. 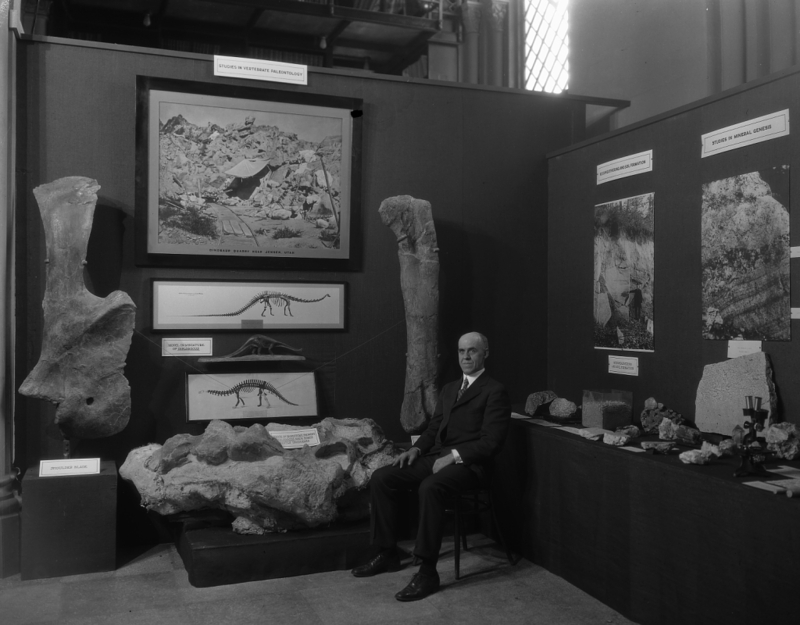 Vertebrate Paleontology Exhibit at the Conference on the Future of the Smithsonian, February 11, 1927, with Charles W. Gilmore, paleontologist and curator. Record Unit 46 - Office of the Secretary, Records, 1925-1949, Smithsonian Institution Archives, neg. no. SIA-MNH-17883B. 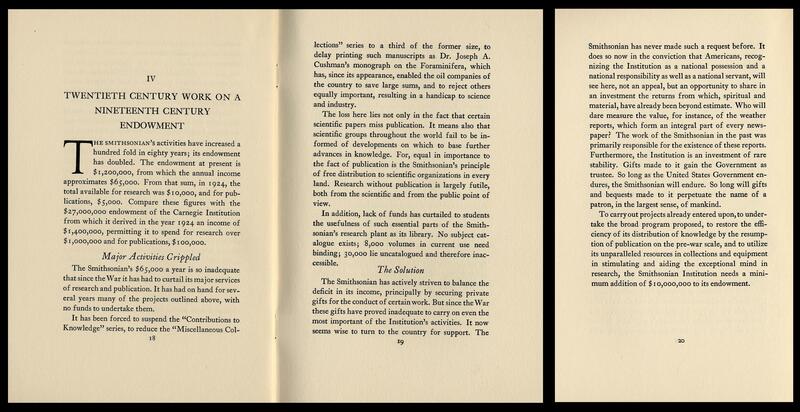 "Twentieth Century Work on a Nineteenth Century Endowment" from "The Smithsonian Institution, A Revelation," 1926. Record Unit 46 - Office of the Secretary, Records, 1925-1949, Smithsonian Institution Archives. 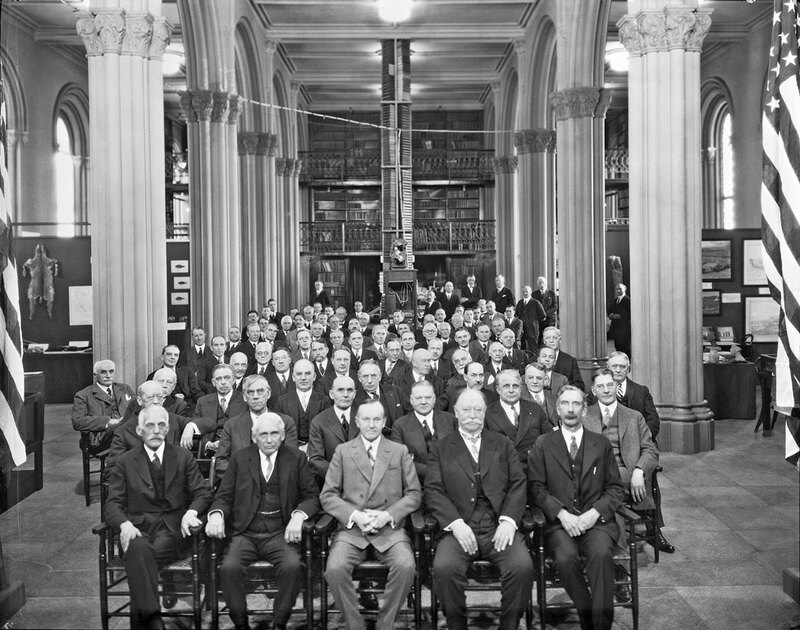 Attendees at Conference on Future of Smithsonian Institution, February 11, 1927. Record Unit 95 - Photograph Collection, 1850s - , Smithsonian Institution Archives, neg. no. MAH-17884A. 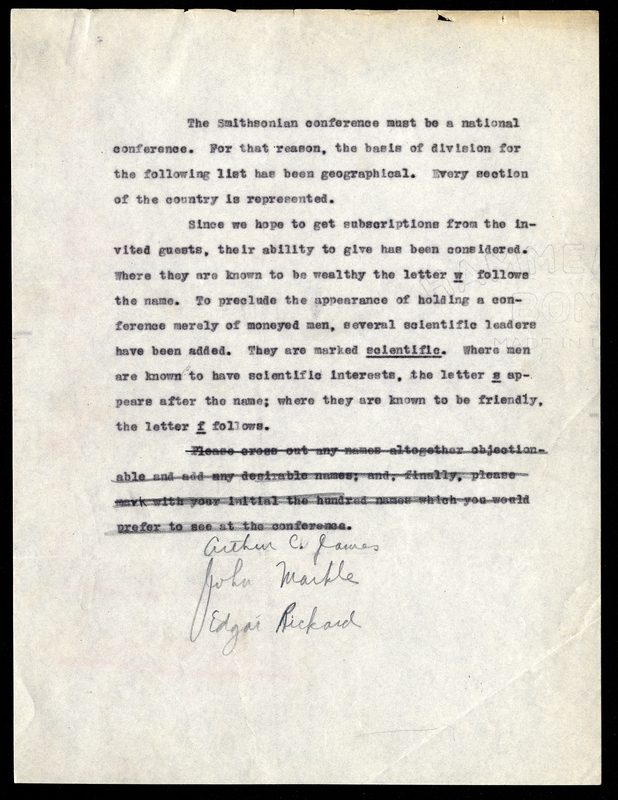 On February 11, 1927, the Smithsonian held the "Conference on the Future of the Smithsonian." Its purpose was "to advise with reference to the future policy and field of service of the Smithsonian Institution." Held in the Smithsonian Institution Building (or "Castle"), scientists, politicians and prominent individuals from across the country were invited to learn about what the Smithsonian was doing and to assist in determining a strategy for the Institution going forward. Staff were asked to prepare exhibits that illustrated their current research and information about the Smithsonian's history was shared followed by a luncheon. As a result of the conference, a new strategic plan was created for the Smithsonian. It was a great endeavor to bring people from across the country to join in learning about the Smithsonian and to help guide its future to be sure. However there was another purpose of the conference; to increase the Smithsonian's endownment. 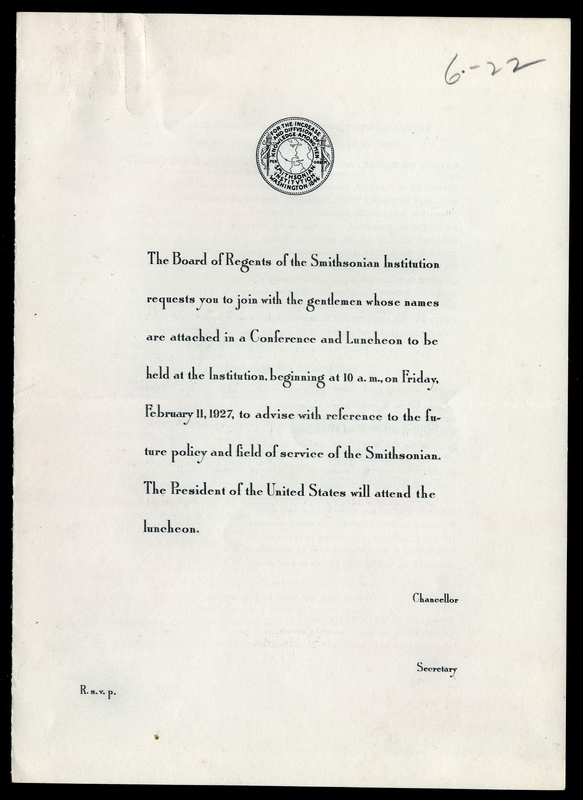 In 1925, the Smithsonian engaged the firm, Tamblyn and Brown to help it with a capital campaign whose goal was to raise $10 million for the Institution. To this end, the individuals were invited based upon not only their interest in science and friendliness to the Smithsonian, but also based upon their ability to give. 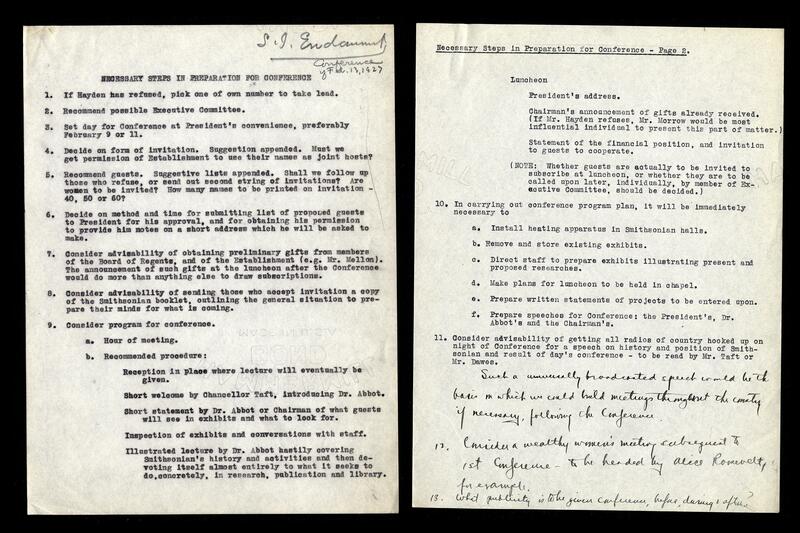 Additionally exhibits were meant to "illustrate present and prosed researches of the Institution" as well as to stress "wherever possible the ultimate economic significance" of the Smithsonian's research work. Attendees were meant to be informed of the important scientific research being conducted at the Smithsonian, but also be made aware of the impact that its research had in contributing to the economy. Unfortunately two days before the conference was to take place Secretary Charles Doolittle Walcott passed away. Assistant Secretary, Charles Greeley Abbot, hosted the conference in his stead, but timing was not on the side of the fund raising effort. With the strategic plan finalized and preparing to launch the capital campaign, the stock market crashed in 1929.